The first wave of Republicans who set out to succeed Speaker John Boehner all had less experience serving in the House than any lawmaker who rose to speaker in modern times. But the candidates’ relatively short tenures put them in the company of many of their fellow House Republicans today, more than half of whom were elected in 2010 or later. Long years of service have been the norm for past speakers, most of whom had accumulated twice as much time in the House as today’s candidates before wielding the gavel. Boehner was not elected speaker until his 11th term in the House, nor was his immediate predecessor, Democrat Nancy Pelosi. Previous speakers with the most prior House experience include John McCormack (D-Mass. ), who was the last speaker without a high school degree, with 18 terms; the recently deceased Jim Wright (D-Texas) with 17 terms; and Joe Cannon (R-Ill.), the powerful 19th-century statesman with the ubiquitous cigar, with 15 terms. The shorter tenures of today’s Republican class continue a congressional experience gap between GOP lawmakers and Democrats, which has persisted since the 1960s and widened after the 2010 elections. Current House Republicans have served an average of 4.6 terms – almost as short a period as following the 1994 elections, when a wave of Republican first-termers gave the party control of the House for the first time in 40 years. Meanwhile, House Democrats now average 6.7 terms in office, among the most for the party over the past century. Today, 31% of House Democrats have served 10 terms or more – the highest share on record – compared with 12% of House Republicans. 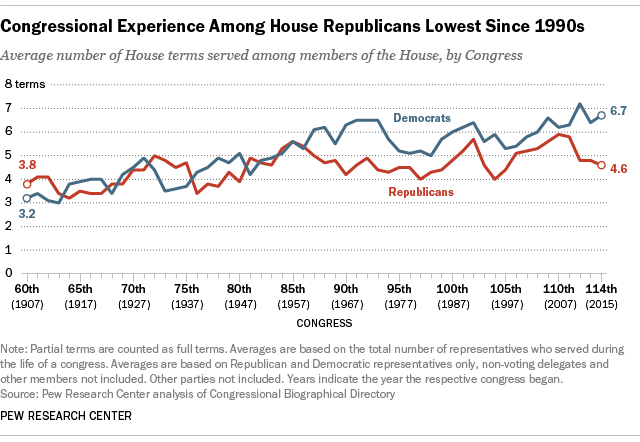 By contrast, more than half of House Republicans (56%) are in their first, second or third terms, compared with 36% of House Democrats, according to a Pew Research Center analysis of the Congressional Biographical Directory. Having less experience, however, may not be a problem for the candidates running for House Speaker, our new poll suggests. When the question was asked of Republicans and GOP-leaning voters in the context of what they want in a presidential candidate, about two-thirds (65%) said they preferred “new ideas and a different approach,” rather than “experience and a proven record.” That 65% figure for Republicans shot up from 36% in March. By comparison, Democratic voters in September were more divided, with 50% preferring a candidate with experience and a proven record, and 42% preferring one with a new approach. Many of the more junior Republican House members are part of the Tea Party class of 2010, which helped give Republicans majority status in the 112th Congress. Citing a mandate from their constituents, Tea Party and other conservative Republicans were often at odds with Boehner. The final confrontation between Boehner and so-called hard-liners – said to number about 50 of the party’s 247 House members – came over their push to force a government shutdown unless Planned Parenthood was defunded. Determined to avoid a shutdown and facing an almost certain challenge to his leadership, Boehner resigned. Seniority in the House offers fewer perks today than it used to. Before the 1970s, the deciding factor for committee heads was usually years served. But in 1974, Democrats adjusted that rule for their own party, calling for chairs to be elected by their caucus; and in 1994, Republicans changed the rule so their committee heads were appointed by the leadership and steering committee and ratified by their conference. Note: This post was updated Oct. 8 to reflect McCarthy’s decision to drop out of the race for speaker. Peter Bell is an information graphics designer at Pew Research Center.